This is one of those times when the blog is quiet, but I’ve been hard at work on stuff I just can’t show you yet. I spent a few weeks on a very special project that I hope to share soon, and then there will be a little series of quilts, including the partially finished one above. Isn’t it funny when you spend weeks or months working on something only to hear, “Where do you find the time?” You don’t find time, you use it — wisely or not, right? Thank you for always posting inspiring and motivating posts. I’m grateful to know you. I was wondering where I could get the complete pattern. I love it. Hi Val, I don’t have a pattern for this because it’s just a half square triangle quilt. I’ve written a tutorial on how to make the blocks here: https://coopcrafts.com/2012/01/05/values-half-square-triangle-tutorial/ It’s a very simple block and very versatile. 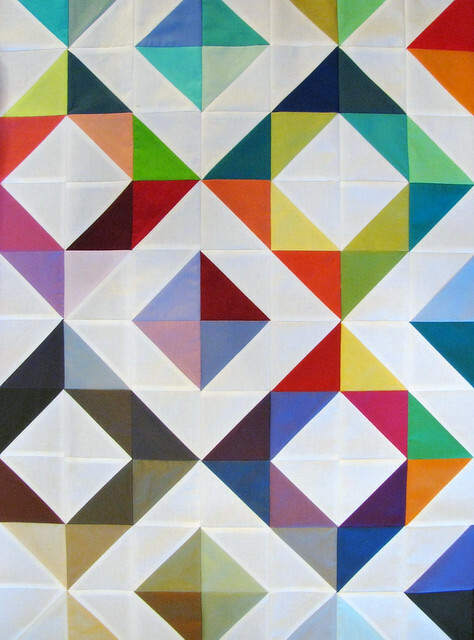 The blocks in this quilt were made with squares of white matched with colored squares. I hope this helps!